Black Bart is tucked in the tall trees and just a short walk down from parking to the welcoming deck. 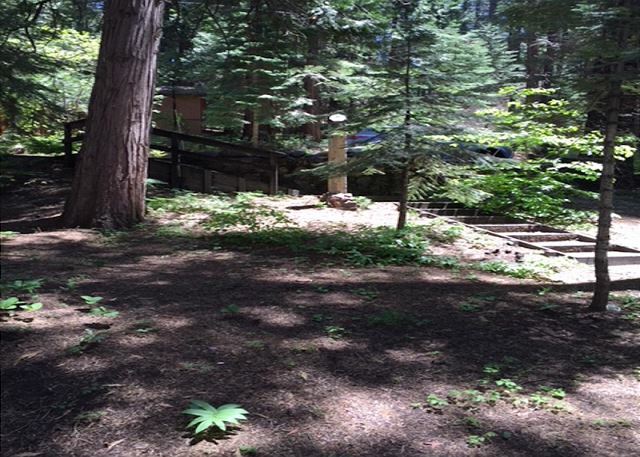 There are stone steps from the parking area to the cabin. The wraparound deck is the perfect place to BBQ, relax and enjoy the fresh air with family or friends. View of the back of the cabin. The wood beamed ceiling adds to the mountain feeling of this cabin. 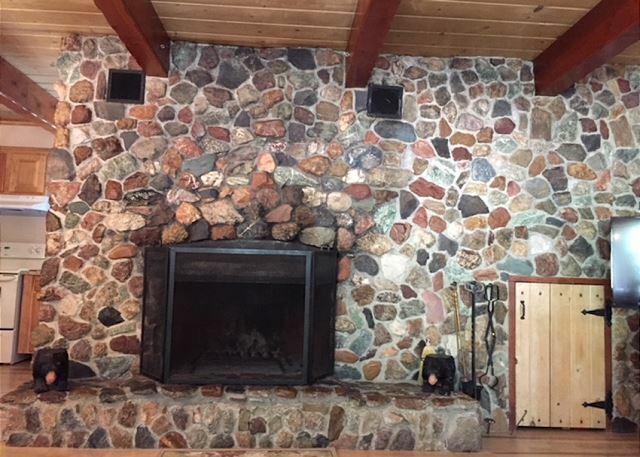 The native rock fireplace will warm the whole house on cool mornings and evenings. The large farm style table easily seats six and can double as a game table. The galley style kitchen is conveniently located by both the deck and the dining table. The first bedroom is downstairs right off the living room and has a queen bed. The second bedroom is also downstairs with a queen bed. The stacked washer and dryer is located in the second downstiars bedroom. The downstairs bathroom has a combo tub/shower. You will be in your own kingdom in the upstairs master bedroom. It has a queen bed, wood paneling, and peace. The large master bedroom can double as a rec room for the kids with a 60 inch TV and plenty of seating for special viewings! There is also a foosball table in this room (not shown in the picture). The master bathroom, two steps up from the master bedroom, is extra roomy and has a shower. The foosball table is in the upstairs bedroom/rec room. 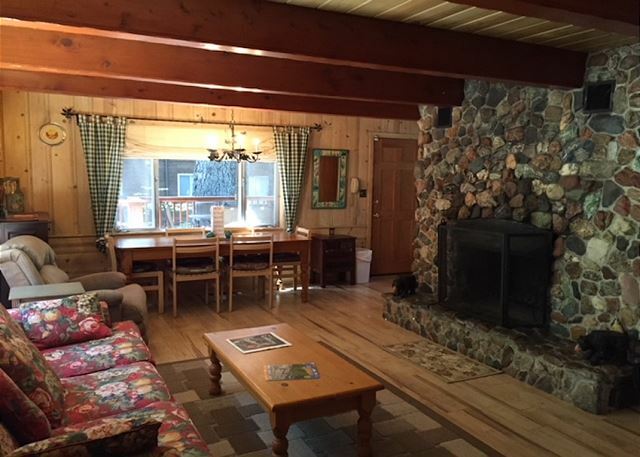 Black Bart guests have free use of the Snowshoe Springs Lake and rec area which is just a short walk from the cabin. Enjoy the woods and meadows of the rec area. There are also picnic tables by the lake for your use. Bring your best friend and explore the Sierras. There are many easy day hikes close to Black Bart. The Arnold Rim Trail and Big Trees State Park both offer close, groomed trails for more access to the beautiful local woods. ALL CABINS HAVE A HOUSEKEEPING CHARGE AND COUNTY TAX IN ADDITION TO THE RENT. 3 Night Minimum During Holiday Periods. 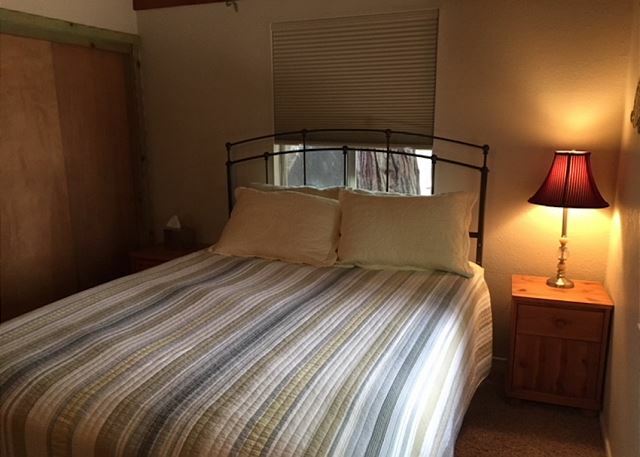 BLACK BART is just a short walk to Snowshoe Springs Lake for free swimming and beach fun and convenient to Big Trees State Park and Bear Valley Ski Area. 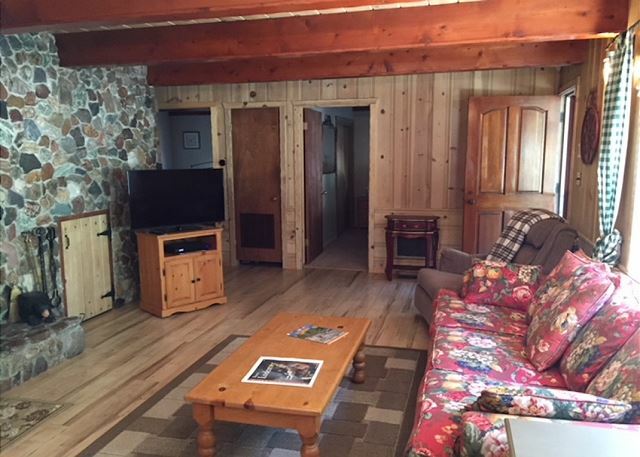 Central heat, gorgeous native rock fireplace, wooden beamed living room, 3 bedrooms/2 bath (3 queen beds), Cable TV, WiFi, DVD player, games & puzzles to share. 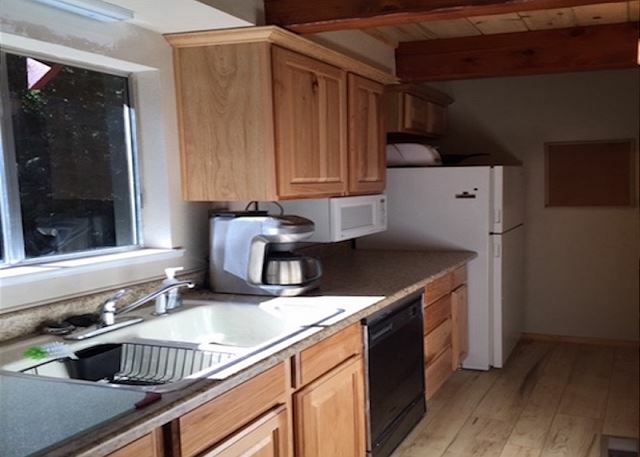 The cabin offers a galley kitchen and an open living/dining room. There is no dishwasher in the home. The living/dining room has large windows and lots of natural lighting and a 42" TV with Comcast cable. The large farm style dining room table easily seats 6 and is great for games also. 2 bedrooms & 1 bath with combo shower/tub are on the main floor. 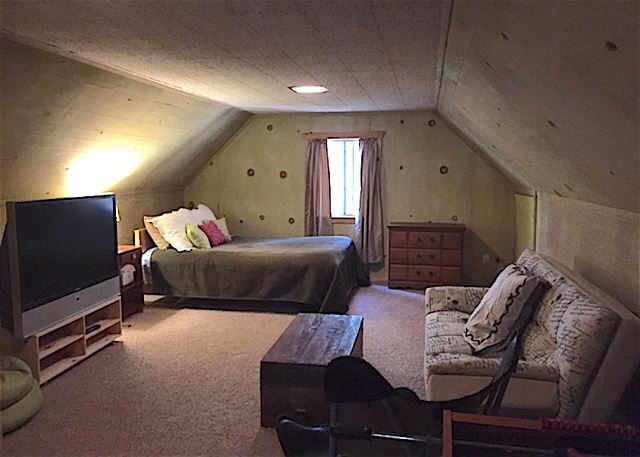 Upstairs is a master bedroom with a private bathroom with shower. The master bedroom can double as a rec room with it's 60" TV, sofa, and foosball table. Newer flooring and carpet throughout bring more light into the cabin. Black Bart also has a wifi compatible printer /scanner for guest use. Tucked in the tall trees with a great wraparound deck for summer relaxation, the cabin has a propane BBQ and propane deck heat lamp which make the deck a popular place. There is also a Weber charcoal BBQ (guests should bring their own charcoal) available. No cost to guests to use Snowshoe Springs Lake and Meadow. No Smoking, PETS WELCOME (pet fee may apply), LINENS PROVIDED. Great little cabin. Had everything we needed but one little thing - an outside hose bib. Sorry, we cannot fix the outside hose bib. 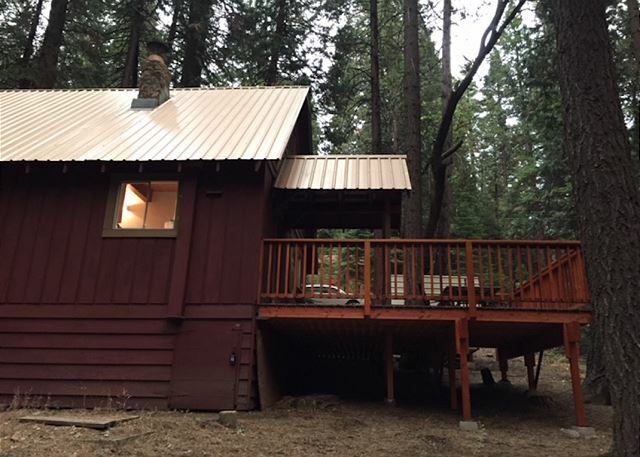 Glad you had a wonderful stay in this charming little cabin in the sierras. We hope you will return to the Black Bart cabin as our guest again.